Hey, Where’s the Ski Slope? 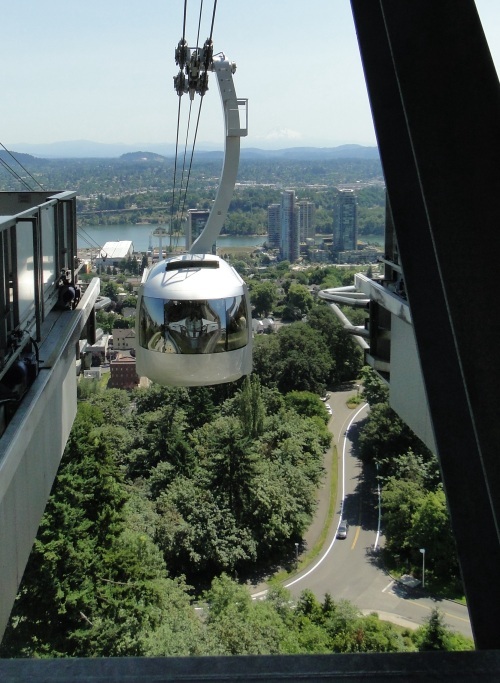 You see that silver, ovoid-shaped aerial tram? It's high in the air heading 500 feet up a hill in Portland, Oregon. Is there a ski slope on the other side? Unlikely in a city that averages under five inches of snow a year. So just where is that tram heading? And why? Portland hosts one of North America's two aerial tram systems built for public transit purposes. (The other, the Roosevelt Island Tramway, connects Manhattan and Roosevelt Island, located in the middle of the East River). Some background. 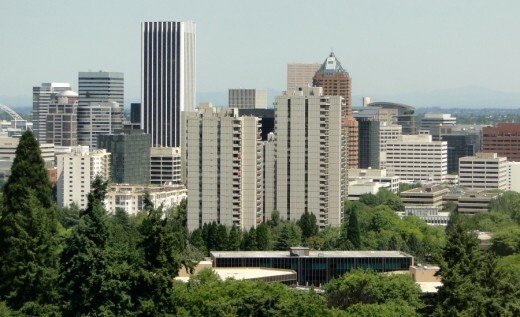 Marquam Hill has been home to the Oregon Health and Science University (OHSU) -- the city's largest employer -- since 1919 when the then University of Oregon Medical School received a gift of donated land there. 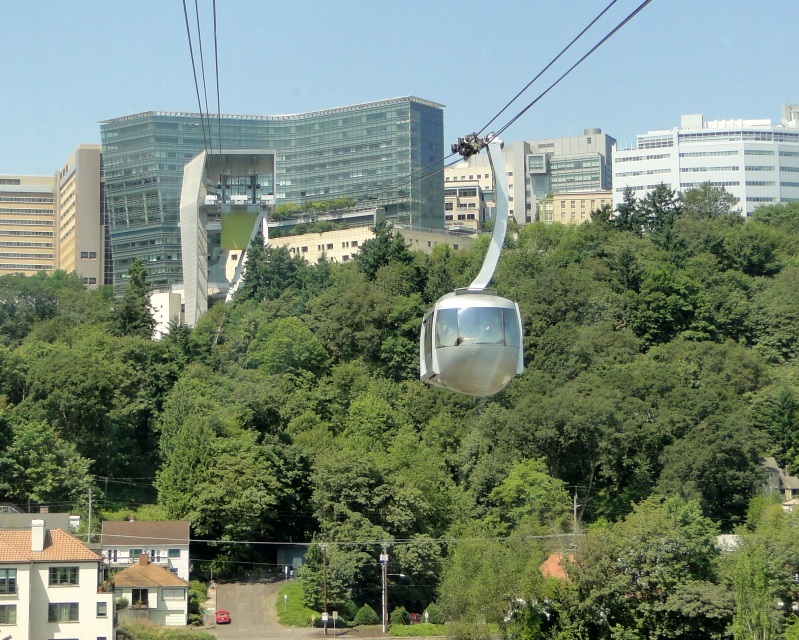 About ten years ago OHSU's and the City's interests converged -- which ultimately led to construction of the tram and its opening in January 2007. Tram heading up to the OHSU campus on Portland's Marquam Hill. All photos in this post by Wayne Senville. 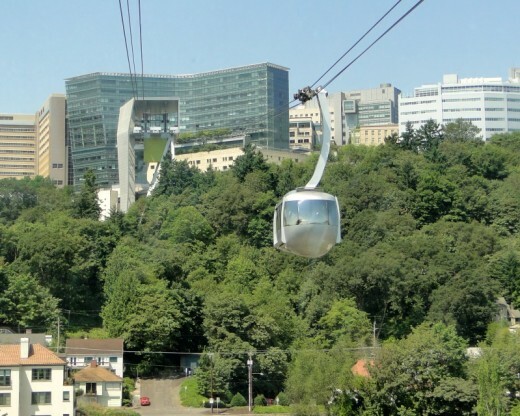 First, OHSU wanted to expand, but lacked space for additional facilities on Marquam Hill. According to Troy Doss, a senior planner with the City of Portland, "the City was concerned about the medical complex expanding in the suburbs" instead of in Portland. 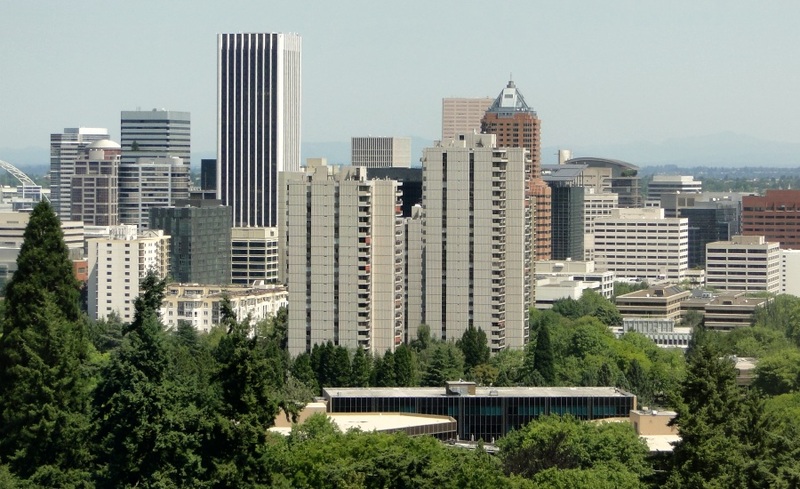 1 OHSU has 14,000 employees, and an enormous impact on the local economy. Both the City and OHSU eyed an opportunity -- "prime for development" mostly vacant former industrial land along the Willamette River in Portland's 130 acre "South Waterfront District." View of OHSU's Center for Health & Healing in the South Waterfront District along the Willamette River. -- OHSU's construction of a 16-story, 412,000 square foot Center for Health & Healing -- directly connected to its Marquam Hill campus. As Doss told me, "without the aerial tram, the University wouldn't have built in the south waterfront." But why not just build a bus line connecting the two OHSU campuses? As Doss explained, OHSU and the City fully evaluated that and other transportation options. One big problem is that there's no direct road connection, and buses would have had to use a circuitous, time-consuming route. There's been some controversy over the cost of the tram. Initial estimates were in the vicinity of $15 million, while the final construction cost came to about $45 million (more details about the financing can be found in the Wikipedia entry). According to Doss, OHSU covers 85% of the ongoing cost of the aerial tram, though it's operated as a public transit facility. 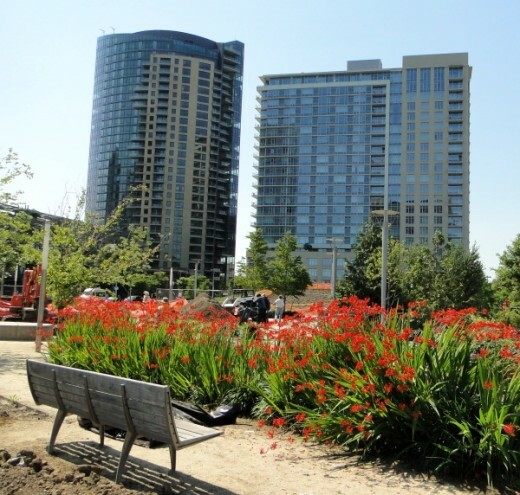 Even more importantly, said Doss, is that as a result of the tram, there is now over $1 billion in private investment in new development in the South Waterfront District -- 2,500 housing units have already been built, with a projected build out of about 5,000 units, housing 10,000 people. The pace of development, however, was slowed by the recent severe recession. The City is also actively seeking to draw other major employers to the South Waterfront District, which will be made even more accessible when the new MAX light rail line under construction between Portland and Milwaukie opens its South Waterfront station. Above: new development, and a new park, in Portland's South Waterfront District. Below: views of some of the new residential housing. Doss told me that there's a wider mix of apartments in the South Waterfront District than elsewhere in the city, with a large number of two and three bedroom units. Among the residents are many faculty, staff, and students who work at OHSU and use the tram for their daily commute. OHSU's fact sheet on the tram, besides also touting the economic benefits of the tram in terms of jobs and investment, notes that the "connection is essential to great health care, discovery and learning: The tram quickly links doctors, nurses, engineers, scientists and students. This critical synergy creates a collaborative environment in which promising discoveries can quickly be translated into new therapies, and in which tomorrow's caregivers will have access to all of OHSU." OHSU is planning additional facilities in the South Waterfront, including a Collaborative Life Sciences Building. View of Mt. Hood from the tram. The tram cars each weigh approximately 12 tons, with room in the cabin for 78 passengers and one operator. During rush hours, the trams depart every five minutes, and can transport 980 people/hour in each direction. The trams, which operate at speeds of up to 22 mph, make the crossing in about three minutes. The two stations are 3,300 feet apart, with a difference in vertical elevation of 500 feet. 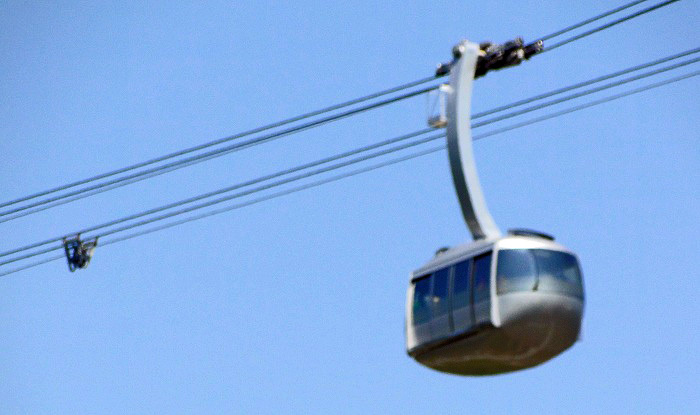 The maximum vertical clearance between the tram and the ground is 175 feet. The tram cars were built in Switzerland and were shaped and painted to look like the architectural firm's vision of "bubbles floating through the sky." Tram arriving at OHSU Marquam Hill campus. 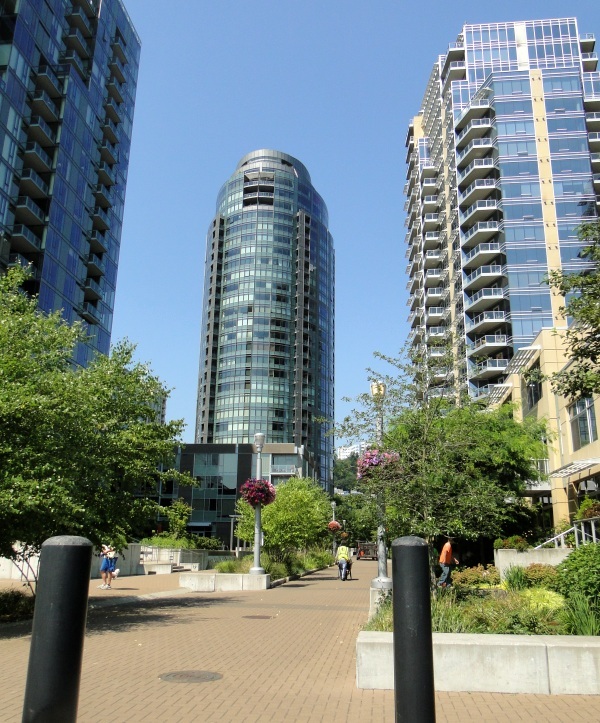 Several of the residential towers in the South Waterfront District can be seen in the background. 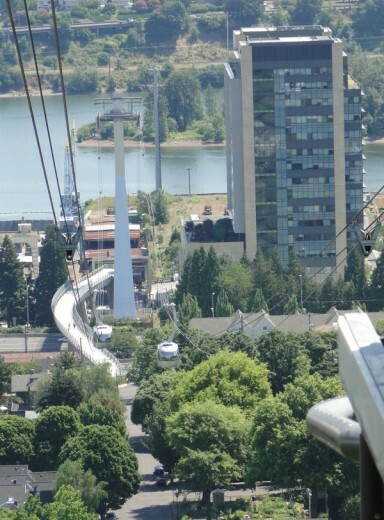 The aerial tram connects at the 9th floor level of OHSU's Marquam Hill campus, which is the primary floor connecting a number of buildings -- several of which are linked by pedestrian bridges crossing steep ravines. It's quite a way to get to work. You have spectacular views of the Willamette River and downtown. There's a very slight rocking sensation during the ride, and the trams don't operate in very windy conditions. 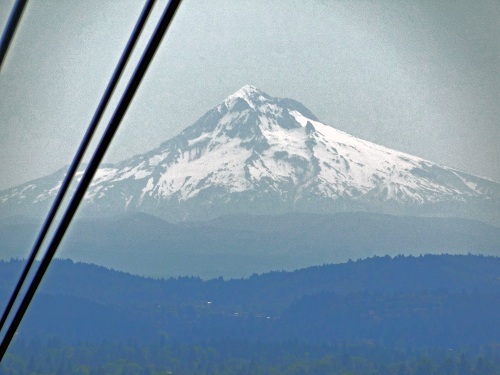 If you travel to Portland, don't fret that there aren't any ski slopes -- you can still ride an aerial tram. Panoramic view of the Willamette River and downtown Portland taken from the aerial tram. Click on this (and any) image to view at larger size. Downtown Portland from the aerial tram.